It’s time for ‘Japan by Prefecture‘ again! This is the series that aims to provide the highlights of each prefecture of Japan, along with my personal favourites and suggestions from readers. This week, we’re looking at Ishikawa (石川県). 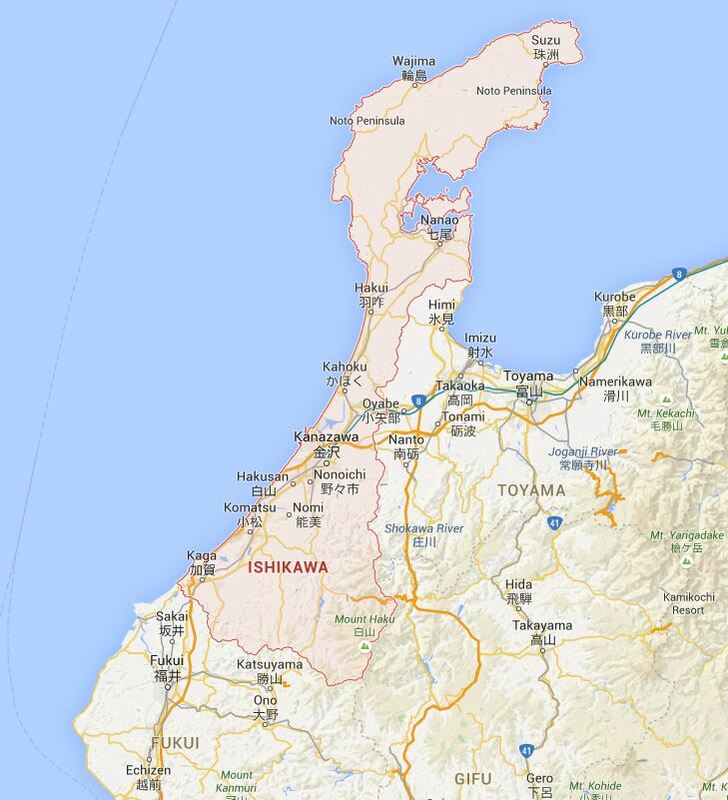 Ishikawa Prefecture is part of the Chubu Region (中部地方), and is also part of what is known as the Hokuriku Region (北陸地方). I have only visited Ishikawa Prefecture once, and that was to go to Kanazawa in 2009. You can read all about that here! It was clear from last week’s comments that Kanazawa is the main attraction of Ishikawa Prefecture, as it was suggested by Japan Australia, Paul, Uncovering Japan and Sengoku Sophie. Japan Australia also suggested the Noto Peninsula and Kaga Onsen as places worth visiting in Ishikawa Prefecture, but Kanazawa was clearly the most popular choice. Kanazawa (金沢) is the capital of Ishikawa Prefecture. It has been an important city in the past, and has come into vogue recently now that the Hokuriku Shinkansen bullet train line (北陸新幹線) is running from Tokyo to Kanazawa in under two hours. The name ‘Kanazawa’ literally means ‘marsh of gold’, and it is said to originate from a legend that the peasant Imohori Togoro washed gold dust in a local marsh. 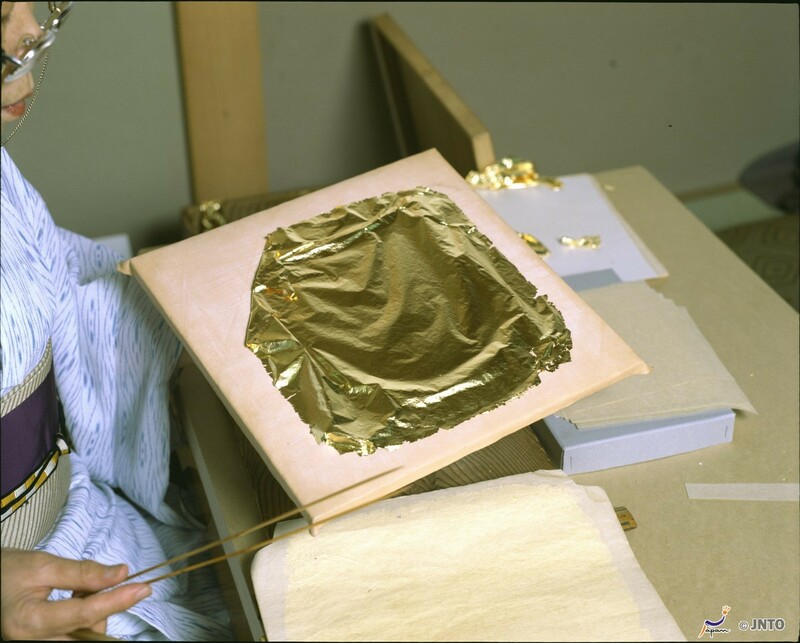 (Source) Still today, Kanazawa’s gold leaf is one of its most popular and famous products and the gold is used in all sorts of different crafts. You can even find gold in the food! 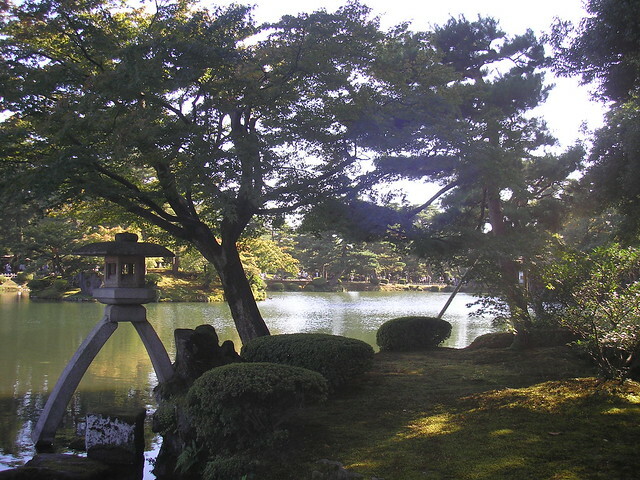 One of the most famous sightseeing spots in Kanazawa is Kenrokuen (兼六園) – one of Japan’s top three gardens. The garden actually used to be the grounds of Kanazawa Castle, and was opened to the public in 1871. The garden is beautiful throughout the year, but especially popular in autumn. 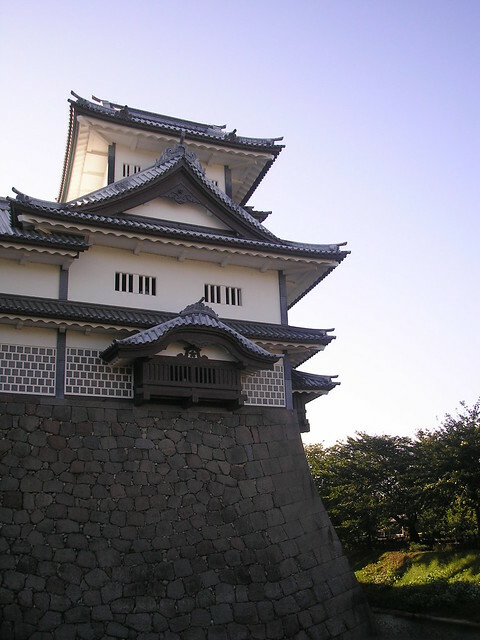 Nearby Kanazawa Castle (金沢城) is not all that impressive compared to some of the original castles in Japan, but if you’re in the area it’s probably still worth a visit. What I personally found more interesting in Kanazawa, and what I would love to revisit, are the old samurai and geisha districts. We always think of Kyoto as being the place to spot geisha, but actually Kanazawa has some beautiful old ‘chaya’ districts or ‘teahouse’ districts where geisha once worked and some still perform today. 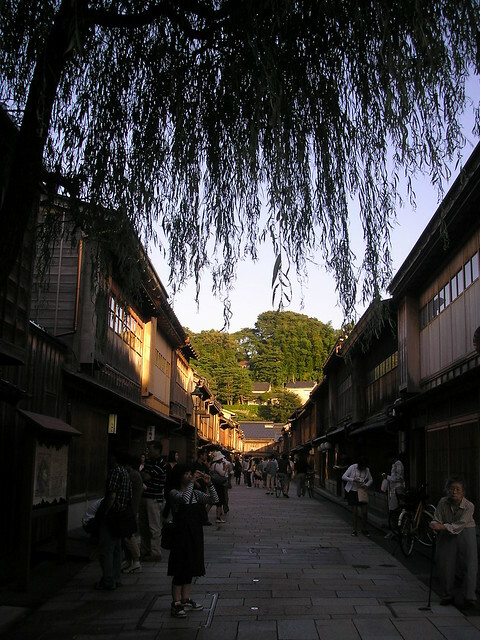 There are three well preserved chaya districts in Kanazawa: Higashi Chaya-gai (東茶屋街), Nishi Chaya-gai (西茶屋街) and Kazuemachi (主計町). 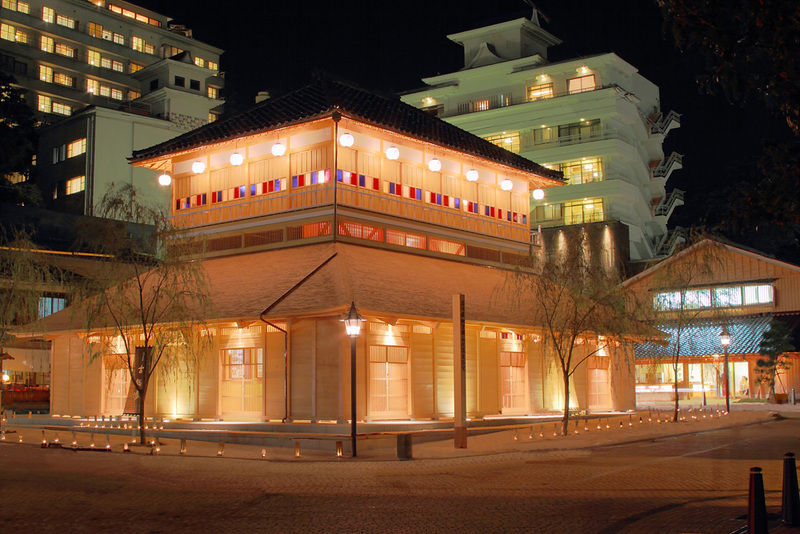 Higashi Chayagai (the Eastern Teahouse District) is the largest and most interesting of the three. 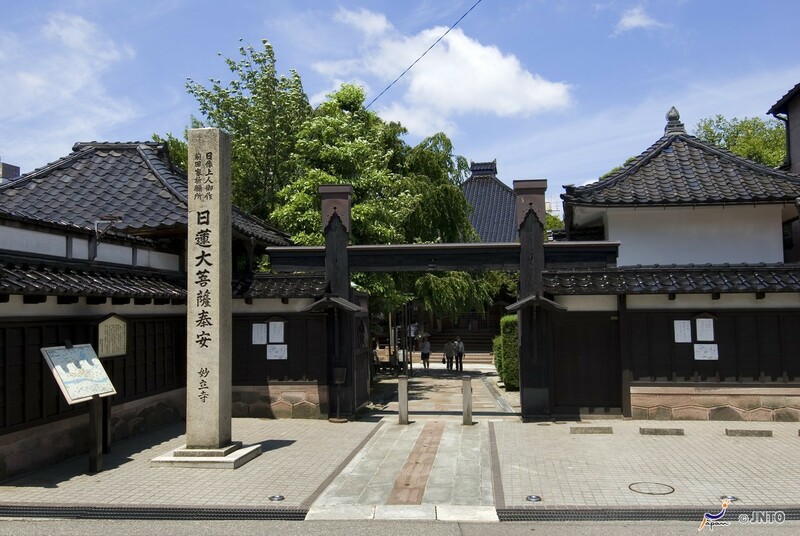 If you prefer samurai, then Nagamachi (長町) Samurai District would be the area to visit. 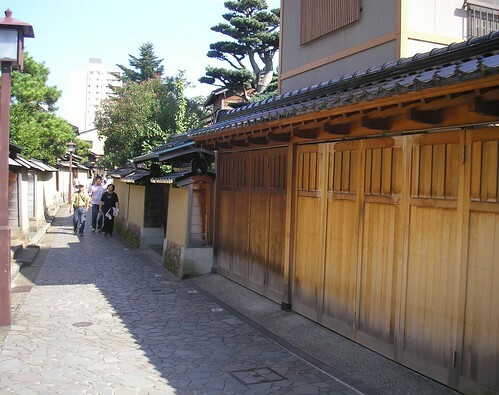 This is the area in which samurai and their families used to reside, and the streets and buildings have been beautifully preserved, much like the chaya districts. Kanazawa is a city with lots of history to offer, but it is also home to one of the best modern art museums in Japan: the 21st Century Museum of Contemporary Art (金沢21世紀美術館 / Kanazawa Nijuichiseiki Bijutsukan). The art museum is very close to Kenrokuen, and opened in 2004. The museum exhibits work by artists from all around the world, and also had a number of public spaces featuring interactive art. 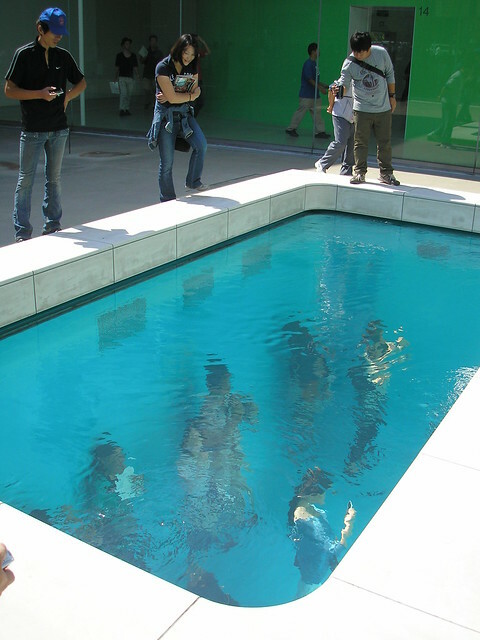 One of the most famous pieces in the museum is Leandro Erlich’s ‘Swimming Pool’, a pool where people appear to be underwater. Kanazawa has a number of interesting temples and shrines, but one of the most interesting temples would have to be Myoryu-ji (妙立寺) or ‘Ninjadera’ – the Ninja Temple. This temple, which is notoriously unwelcoming to foreign tourists and therefore quite hard to visit, features no actual ninjas but does feature all of their tricks. The temple is designed with tunnels to confuse enemies, hidden floors and secret doors. I’d love to visit there one day! Kanazawa is often referred to as ‘Kyoto’s cousin’, and I can see why. Although Kanazawa is another large city, I think it has a little more of what people expect to find in Kyoto, such as the beautifully preserved geisha and samurai districts and the beautiful Kenrokuen. Don’t get me wrong – Kyoto had these too – it’s just that you have to look a little further past the concrete buildings. So, Kanazawa is definitely Ishikawa Prefecture’s most interesting area, but let’s see what else the prefecture has to offer! The Noto Peninsula (能登半島) is certainly worth a mention, as it makes up half of northern Ishikawa Prefecture and is an area full of beautiful coastal scenery. It is not that accessible though, and is definitely best explored by car. As the area is not easily accessed, that makes it a place with far fewer tourists, which is part of its attraction. If you’re looking to really get away from it all – this would be a place to visit. Wajima City (輪島) is a popular stop in the Noto Peninsula, and is famous for its morning market. Wakura Onsen (和倉温泉) is also popular, but looks to me like a typical large onsen town. 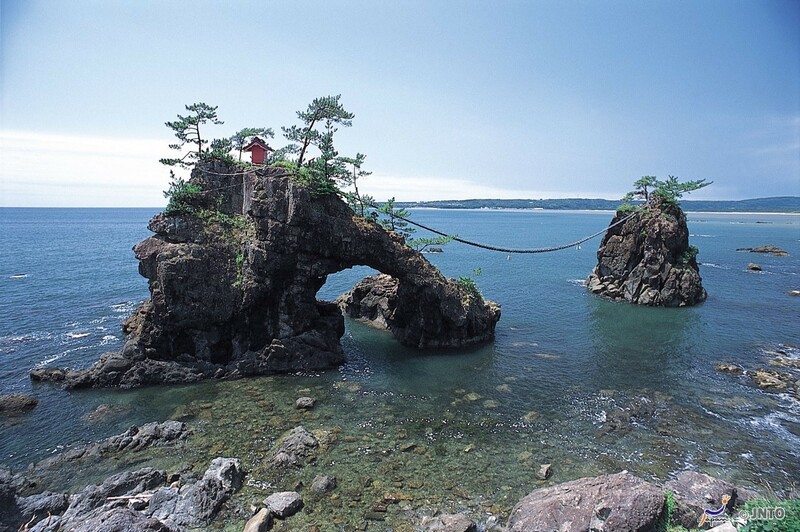 I think it is probably the little pockets of quiet coast that are the really attractive parts of the Noto Peninsula. Finally, I’ll briefly mention Kaga Onsen (加賀温泉), a collection of a number of hot spring towns just south of Kanazawa in Ishikawa Prefecture. Among them are Yamanaka Onsen, Yamashiro Onsen, Katayamazu Onsen and Awazu Onsen. These are places to relax and enjoy shared hot spring baths, each with their own different types of ‘healing’ water. The water at Yamashiro Onsen is called ‘water for longevity’. 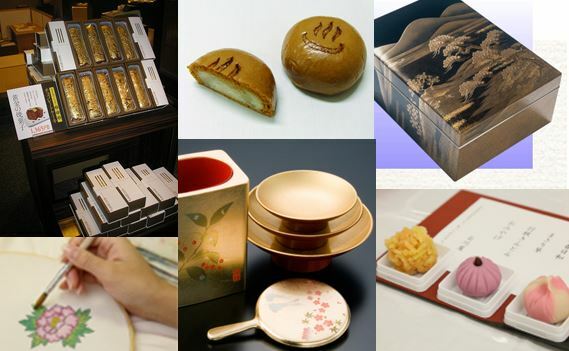 Of course, a lot of Ishikawa Prefecture’s souvenirs (or ‘omiyage’ / おみやげ) will feature gold leaf and there are all sorts of shiny crafts available to take home. Lacquerware is also a popular souvenir from Wajima and Kaga Yuzen (silk fabric) is popular too. Other than those, wagashi (sweets) are the most popular souvenirs and there are places where you can try making your own. 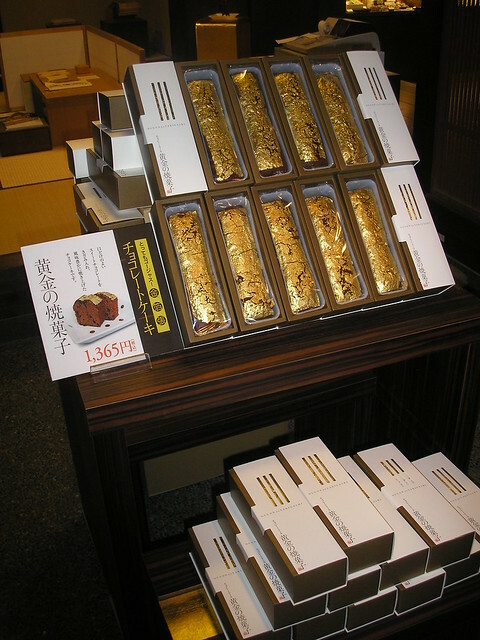 I also came across a special kind of sweet known as an ‘Onsen Manju’ from Yamashiro Onsen (top centre). Next week I will be writing about Fukui (福井県). Have you been there? What’s good to eat there and what omiyage should I buy? What are the best sightseeing spots or hidden gems? Please do share your thoughts below, and join me next week for Japan by Prefecture! One of my personal highlights was Eiheiji Temple. I’ve visited Fukui Prefecture a few times know and have always enjoyed my visits. I recommend Eiheiji Temple, Tsuruga, and the Fukui Prefectural Dinosaur Museum. My university has a relationship with the Fukui Prefectural Dinosaur Museum, and a lot of excellent paleontology research goes on there. I agree with Japan Australia that this is a great place and well worth the visit!